The career fair at American River College on Thursday gave students the opportunity to network with employers within the fields of majors offered on the campus and more. 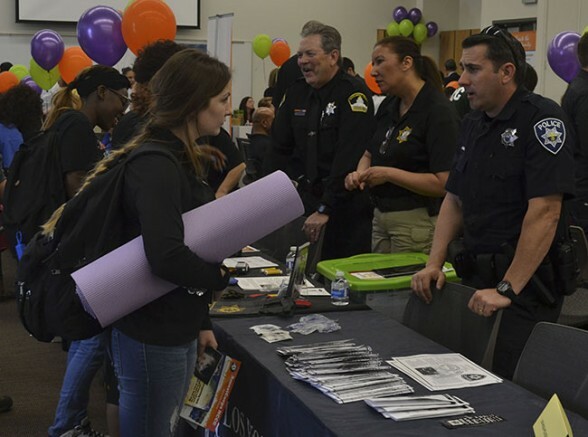 Students got the opportunity to speak with various business representatives and employers of particular career sectors, like the Los Rios Police Department, Platt Electric, Platinum Living Services, the U.S. Army and SMUD. Platinum Living Services representative Angelina Garcia said that they were looking for someone who was reliable, dedicated and able to work in a fast-paced environment. “We are an assisted living company in retirement communities, so someone who loves the elderly and are willing to meet our skills standards are who we’re looking for today,” Garcia said. ARC’s Stripe Pre-Apprenticeship program was another employer in attendance, seeking students who are interested in construction and looking to promote their advanced manufacturing apprenticeship. “We are looking for students who are at least 18 years old, is a high school graduate or has a GED, and is able to perform the work,” special projects coordinator Staci Teegarden said. “You don’t necessarily have to have the skill, just the interest,” she said. ARC student Isaiah Mills said that he appreciates ARC for having the career fair because it gives students an opportunity that they may not typically get. “This gives us a chance to get a feel for the job market right now,” Mills said. The career fair was held from 10:00 a.m. to 1:00 p.m. in community rooms 1-4 next to the student center. The employers donated money that will be used to sponsor 10 new scholarships, up to $500 a piece, for a range of majors. Student Services supervisor Breanne Holland thanks the employers for participating in the career fair. “We appreciate the employer’s attendance because not only are they displaying job opportunities to our students, they are benefiting their education also,” Holland said. The career center aids students in planning for college, preparing for employment, resume building and researching current job openings. Be the first to comment on "ARC hosts career fair"